Virus is the Latin word for poison. Since the beginning of time, people have been plagued with viruses. They seem to come and go causing epidemics and outbreaks that make many people sick and in some instances cause death. A virus is simply a clump of DNA material contained within a protein coating. And, unlike bacteria, they can only become active inside a live host. Viruses are smaller than bacteria and have the bad habit of going dormant, to reappear later causing worse symptoms with each outbreak. Some examples of viruses are rhinovirus (common cold), hepatitis, Epstein-bar, ebola, HIV, influenza(flu). Timing seems to be very important in treating viruses. They go through several stages, including the dormant stage, and can morph into stronger strains with each generation. They are difficult to diagnose and are a challenge to fight. They all attack the immune system. So, to naturally fight these viruses, prevention is the best course. If your immune system is strong, there is a very good chance that you will kill the virus in your system before it causes any symptoms or at the very least, the symptoms will be mild. A doctor on the Discovery channel was lecturing on this very topic one day and said that the human immune system has all of the DNA codes to all of the viruses. If every individual would strengthen their immune system, that would be the best way to prevent sicknesses caused by viruses. Your first line of defense includes skin and mucus membranes, sweat glands, hyaloronic acid, saliva and mucus, stomach acid, gut flora (pro-biotics such as acidophilus), and your bio-electric field. Our space is limited, but don’t put your fingers in your eyes, nose or ears, wash your hands often, use a dry sauna or do aerobic exercise to sweat, take enzymes (they can break down that protein coating), take a quality pro-biotics with several of the good bacteria and get plenty of rest. Also, keep in mind there are many wonderful herbs and supplements that build the immune system. All of these things work together to give you Better Health, Naturally. What is the difference Between Virus and Bacteria? There are a number of differences between a virus and bacteria, or more appropriately, viruses and bacteria, including their relative sizes reproduction methods and resistance to medical intervention. the singular form of the word bacteria, is a one-celled living organism, with complete sets of both ribonucleic acid (RNA) and deoxyribonucleic (DNA) genetic codes. A virus is little more than a section of RNA or DNA covered by a protein shell. Bacterium, therefore, is at least a hundred times larger than a typical virus. One major difference between viruses and bacteria is the method of reproduction. Bacterium is a completely self-contained and self-reproduction unit. When the time is right, bacterium will split it's DNA and RNA genetic material in two. Separate cell walls will build up around these two new bacteria, and this process will continue until thousands or millions of bacteria have formed. This is how strains of bacteria survive in almost every environment on earth, including non-living surfaces like rocks or plastic. cannot reproduce without a living host. A virus may lie dormant for thousands of years before finally coming into contact with a suitable host. Once it enters the body of a host, a virus uses leg-like appendages to clamp onto a cell and a spike or chemical coating to penetrate the cell wall. Once inside a living cell, a virus replaces the cell's original DNA or RNA commands with it's own genetic instructions. Those instructions are usually to make as many copies of the virus as possible. Once the individual cell has outlived it's usefulness, it explodes and sends out thousands of copies of the original virus to other unsuspecting cells. Once the immune system has created a very specific "anti-germ" just for one particular bug, you then have at least a few of those anti-germs in your body for the rest of your life. Your body is capable of recognizing an astonishing 100,000,000 different types of bugs! The electron microscope picture to the left is a macrophage (large, orange) attacking germs (small, green). ("Macrophage" simply means "large, eating." 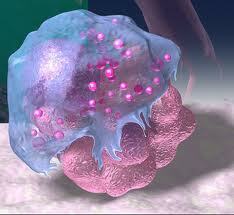 The macrophage is a general purpose antibody -- it eats any type of bug! There are also "specific" antibodies, which attack only one kind of bug. Germs are surprisingly very neutral. They can do absolutely nothing to healthy living tissues in our bodies. It does not even really matter what germs we come in contact with. Ever wonder why several people can be around the same germs, but only a few of those people get sick while the rest remain healthy? Germs and other microorganisms can only feed on dead tissue in the body. The tissues in our bodies start to die as the pH balance of our bodies becomes too acidic. The acidic environment of an unhealthy body gives the germs freedom to feed and grow. The Germ Theory was developed by Louis Pasteur, who admitted near the end of his life that the theory was in fact a fraud. He even said it was not the germs which were the problem of disease, but the medium in which they lived. Even though Pasteur recanted on his Germ Theory, it is still widely used today as fact in the medical field. Many people are resistant to considering the fallacy in the Germ Theory. Think about it, isn't it much easier to blame germs for your sickness than to take personal responsibility for how you have been treating your heath? We certainly cannot tell someone who is sick with the flu that they are responsible right? Lets just blame it on those mean germs that are out to get us. In the acidic state of an unhealthy body, germs can quickly mutate into other more dangerous and even deadly pathogens. It is important that we are proactive in our diets and work on developing a natural pH balance in our bodies that is more alkaline so the germs we come in contact with will not be able to grow or mutate. A healthy body is alkaline in nature with a pH of 7.2-7.6 (7.0 being neutral). A variation too far in either direction makes a person vulnerable to disease. The more acidic the pH of your body, the higher your chances of death because the body actually starts to die off. If you’re looking for superior cleaning services and amazing results, then you’ve come to the right place! to keep your mind at ease and protect your assets. We strive to earn the loyalty of our clients through hard work, fair pricing, and above average customer satisfaction. The pigeon is the number one urban bird pest. They exist in large numbers in every city across the country. Pigeons are not afraid of people; they roost and nest readily in man made structures and they have a diverse diet. The standard pigeon has a short neck with a small head. Their short legs with the level front and hind toes allow them to perch on branches as well as walk on flat surfaces. House cleaning is not at the top of most peoples list of fine things to do but if you let your mind wonder too much, you'll spend even more time cleaning. Focus on what your doing, make every move counts, and you'll finish more quickly. Household organizing and cleaning can be done quicker than you think. Dust first, vacuum last. Start dusting from the top of the highest shelves, the tops of cabinets. These tend to be less dusty than lower shelves. Even if you dust quickly, you'll be moving the dust down to a lower level, usually the floor, where it is easily vacuumed away. Use the right product for the job. Use natural cleaning products if possible. We don't use fancy cleaning product that but it's important to use good quality, heavy duty cleaning products that do a great job. This doesn't mean you have to spend a lot of money either. We use a solution of vinegar and water to damp mop linolium or vinyl floors. It works great. The sink, for whatever reason, can stink. Learn now to prevent one of the most common workplace accidents before you end up paying out in huge claims! Make sure workers are wearing proper footwear for their work area. If necessary, provide them with the correct footwear. Use mats and rugs where spills of liquids are likely. Make sure the edges are beveled to prevent tripping and the mat has slip resistant backing. The earlier you attack this problem, the easier it will be to remove the ring. A thorough cleaning with a commercial acid-based bowl cleaner may do the trick. If the bowl cleaner doesn't work, try using a green, nylon-backed scrub sponge along with the acid. For an old ring, use a pumice stone. Wet the stone with the water in the bowl and rub it on the ringKeep the stone wet the entire time you're scrubbing. Pumice stones should only be used on vitreous china toilets - never on colored, enamel or plastic fixtures. Once you've gotten rid of a ring, weekly cleanings should keep it from coming back.